The Tub vs. Shower Debate. You may have your heart set on one or the other, but experts recommend having at least one bathtub in your home. Whether it is in your full bath or master bath, it is a good idea to install one bathtub. Sometimes, doing a shower + tub combination will work out more for families. Double Trouble. If you have a larger family, installing two sinks into your full bathroom may help. This will allow two people to get ready at the same time and it can help move things along in the morning. Room for Everyone. Most likely, if you own a full bathroom upstairs, it will be used as a community bathroom for all your guests and family members. Since it will be used often, you want to make sure that you provide enough storage for everyone. While designing your new bathroom, make sure you incorporate extra drawers, cabinets, and shelves for everyone’s belongings. You can even purchase baskets and bins as decor and organizational pieces later on in the design process. Kid-Friendly. If you have younger children, you want to make sure everything is fitting for a little one. You may or may not choose shorter countertops and pinch-free drawers to accommodate, but always keep in mind your small ones. Easy-to-Clean Materials. 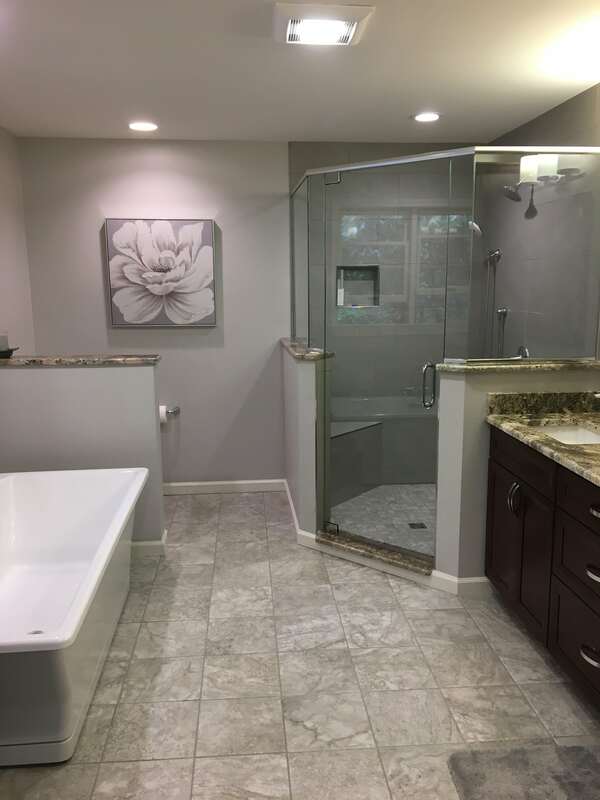 Whenever you are deciding on a material for the bathroom, ask yourself “how easy will this be to clean?” This bathroom will get a lot more foot traffic than your master bathroom; therefore, you want to make the cleaning process easier on yourself. Opt-in for easy-to-clean countertops and flooring to help keep your mind at ease. No matter what room, the material you choose can make quite the impact on functionality and impressions. Update your full bathroom floor, countertop, wall tile or backsplash today and you will not be disappointed. We have a knowledgeable, expert staff ready to help you along the way. Do not hesitate, stop in today for more information and to view our showroom.